Please, right this very moment, if you are reading this trying to figure out where the catastrophe of your grief fits in a little box, STOP. The truth is, there are no five stages. Or ten, or twenty, or ninety-five. There is no one way to grieve, only your way. 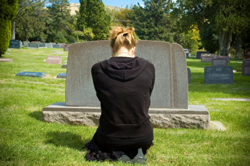 There may be characteristic emotional experiences such as anger, denial, bargaining, depression and acceptance, but there is far more to the experience of grief than just those five pieces. Could you categorize a wave in five stages? Maybe. Rise, break, crash, fall, recede. Sounds a lot like the experience of grief, doesn’t it? But, no wave is the same as the next, and each one brings with it different force, sweeping undercurrents and ebb tide flows. Some pool around your feet, some throw you to the bottom of the ocean gasping for air, wondering which way is up or down. So it goes with grief. So, I kind of figured it out on my own. I found that grief is very personal, as personal and intimate to each of us as the relationships we held with the loved ones we buried. Grief, to me, is the cutting and re-stringing of 3,000 different threads between that person and I in the aftermath of their death. Each string represents a memory, a hope, a joy, an experience, a piece of my life that they fit into perfectly. Unraveling those strings that are cut instantly the moment someone passes, that is the work of grief, and the only “healing” I truly find is stringing my way from the sorrow I feel back to the joy that preceded it; the joy that person gave me. I have found with each person I lost there was one reason in particular why I loved them so much, one primary need they filled for me. My friend Mike was a shower-upper – first one to be there for wall painting, moving, babysitting, cooking a meal, fixing a bad pipe. He died from an “unknown cancer” one week before his 40th birthday, three months after his diagnosis. In his honor, I show up now for others, and in doing so, I feel his presence in my life. My Grandma Annette was also a shower-upper, but in a different way. She was one of few people in my life who picked up the phone and called after every single devastation we experienced. For her, I pick up the phone, too, even when I’m uncomfortable, even when I don’t know what to say, whenever there is a death or a loss. The five stages may be initial reactions that many people have to bad news, devastation or loss of any kind. But, grief itself is like a life form, like a wave. It ebbs and flows. 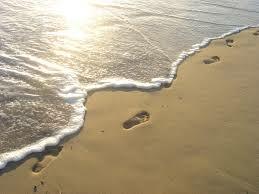 It stays with you forever, even if all you feel is the last drops of the wave reaching your bare feet. It’s always there, and loud, crashing waves can seize you unexpectedly at any time in the rest of your remaining days on Earth. They say time heals. I think time just teaches us how to dance with the waves. Because the truth of life is “the promise of sickness, aging and death,” as the Buddha put it. None of us are immune, in fact we are united in our grief. Life is the getting back up part. It is the brutality of heart break in so many different forms, and it is the powerful love that precedes it. We are always on one side or the other of that string. Our life’s work is allowing ourselves to feel the sorrow while somehow braiding the strings back together to joy. There is no right way, no one way, only your way to honor the death and the lifeof the person you miss. May your tribute be as unique as you are. Megan Aronson is a writer, mother, spiritual seeker, and self-certified Grief Expert who teaches the art of conscious grieving after developing a way to heal her “unattended grief” through a devastating string of losses in her life. She is the Aunt to an angel who died just before his third birthday, and the author of a popular blog, “A Writer’s Journey Inside Out.” As a freelance writer, her work has been seen across Northern Arizona. She is currently working on her first book, a memoir on life in death. Willingly throwing herself deep into the ugly underbellies of cancer and death, the earlier loss of her two year old nephew, the personal betrayal of losing her baby to a miscarriage, and the purifying astringent of the recession stripping away the “stuff” that soon proved to be unnecessary, Megan's writing takes her readers on a journey to peace and awakening through each powerful loss experience. She also volunteers for several non-profit organizations including the Alzheimer’s Poetry Project: Arizona Assignment, Young Voices Be Heard and Camp Soaring Eagle. Thank you for sharing your experiences and how you “show up” for others. I think many people often don’t do anything because they don’t know WHAT to do, but it’s really the simplest of things. I`m greiving the lost of my boyfriend of 6 yrs. It`s been 1 1/2 mths. he got killed right across the street from me and it hurts so bad every time I look at the building everyday. I`m wondering how do I cope with the lost of him? I`m so depressed here lately, can someone please help?